Heat the oil in a large skillet over medium heat, and when the oil is hot, saute the meat, onion, bell pepper, garlic & steak seasoning until the meat is browned & the onions & bell pepper are limp. Transfer the mixture to the slow cooker. Add the remaining ingredients & stir to mix well. Cover with the lid & cook on low for 2-4 hours. 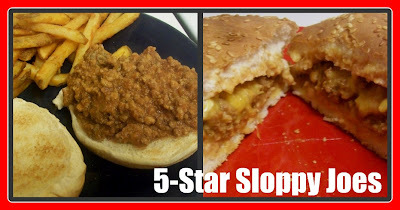 When it is ready, toast your hamburger bun, top with the sloppy joe meat & top with a little cheese. YUM! I like sloppy joes and I like to make them in the crock. Might have to try this recipe because sometimes it's just nice to mix things up a bit. Lillian loves sloppy joe's. I always make them for her homemade, but am always up for something different. I will have to try this! Have a great weekend. I'm not a fan of sloppy joes, but my husband would love this! I would love that cookbook! I was just telling my sister that I think I'm addicted to my crock pot because I've cooked 3 meals this week in it!